Mac’s Seafood restaurant P-town Will Make You Hunnngry! 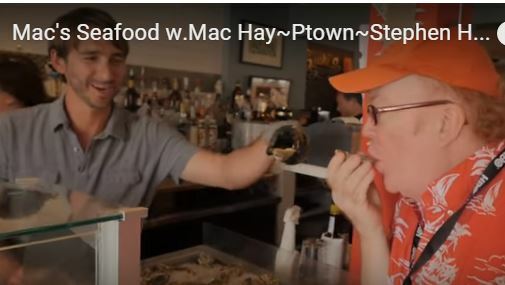 One of the best seafood restaurants in Provincetown, Massachusetts is owned and operated by seafood chef & oyster entreprenuer extraordinaire Mac Hay. At his Raw Bar, Mac demonstrates how to shuck a Welfleet. oyster and also a Littleneck Clam. He also takes us backstage to his kitchen were he demonstrates how to make sauteed mussels. Yum! He also has two other seafood restaurants in Welfleet and Provincetown. This video is guaranteed to make you HUNNNNGRY! 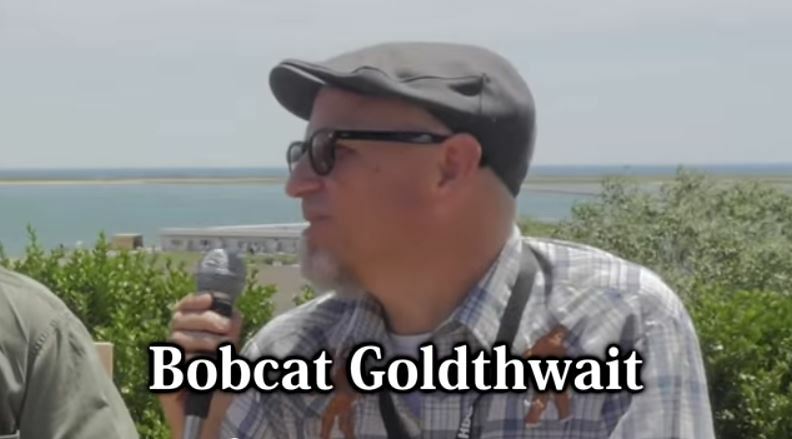 Very grateful indeed for this great interview with Provincetown Film Festival’s Filmmaker on the Edge Bobcat Goldthwait. He was being honored for his powerful doc “Call Me Lucky.” And the subject of the doc, which starts off seeming to be about the Stand-Up Comedy scene in Boston turns a sharp corner as it reveals that Crimmins was the victim of child abuse. Crimmins doesn’t hold back on his outspoken views on the Catholic Church, and Goldthwait speaks movingly of the death of his close friend Robin Williams. He claims that it was a disease known as Louie Body, a cancer syndrome that literally causes the brain to eat itself, that led to his friend’s tragic passing. Thank you, Bobcat and Barry, for being so forthcoming and for making this incredible documentary, which I saw TWICE in Provincetown. Goldthwait reveals also that Robin Williams gave him the money to start making”Call Me Lucky” which is coming out later this summer nationwide. The film is dedicated also to Williams. Don’t miss it! Introduction to the Provincetown Film Festival 2015! A little teaser/trailer as it were, filmed in NYC BEFORE I left for the Provincetown Film Festival last month. A couple of points, it CONTINUED to be cold and rainy, and the weather was REALLY bad on the day of my departure, as you’ll see. And because of circumstances beyond my control, I didn’t fly Cape Air. In fact, the weather was so bad that day, they weren’t flying at all out of Boston to Provincetown, so I switched to my trusty, loyal sponsor of many years the Provincetown Bay State Cruises Fast Ferry. So I traveled to Provincetown, yes, by SEA, in a storm! The likes of which I’ll never forget! Stay tuned! Which is exactly the sentiments Elle herself would express, if asked. Elle is Tomlin’s great late-in-life come-back role and she tears into it with fierce gusto, as well as sad-eyed pain. Her teenaged, blonde-afro-ed grand-daughter Sage(Julia Garner), turns up pregnant and needing money for an immediate abortion. Grandma is broke and has cut up all her credit-cards and turned them into a mobile. How Elle solves Sage’s age-old problem is the hilarious/heart-felt crux of the film, and Marcia Gay Harden, already an Oscar winner for “Pollack”, turns in an awards-baity performance as Elle’s disliked daughter and Sage’s equally disliked Mom. Tomlin was nominated once before for an Oscar in 1975’s “Nashville”, but she has never won. And that was 40 years ago! The Provincetown weather this year was not the usual tourist-friendly warmth and sunshine by the sea. It was cold and it rained. Which meant everyone went to the movies. And the movies were better than ever! Also a stand-out was former stand-up comedian-turned-director Bobcat Goldthwait’s “Call Me Lucky”, purporting to be about fellow stand-up Bostonian Barry Crimmins, it turns into a scathing indictment of the Catholic Church and its’ continuous cover-up of child abuse. In an abrupt, but deftly-handled 360 degree turn in the film, Crimmins reveals that he himself was an abused child. And the film keeps hauntingly returning to the subject “The Basement,” where the abuse happened, and then finally taking the film and Crimmins to the basement itself. Harrowing,”Call Me Lucky” is not to be missed. I saw it twice and feel it is one of the Year’s Ten Best. It goes into wide-release in 25 cities in August. Another doc, (PIFF was really landing one great documentary after the other) that thrilled me and made me very, very proud was the stirring “The State of Marriage” which dealt with the hard-fought battle for Marriage Equality in the State of Vermont. In excruciating and amazingly detailed on-the-spot footage, this inspiring doc tells the untold story of how three women lawyers changed the world. Bostonian activist Mary Bonauto joined with small town Vermont lawyers Beth Robinson and Susan Murray in a two decade long, epic struggle and built the foundation of the laws and rights that has made so many gay couples happy today. “The State of Marriage” is a thrilling call to arms that enlightened me and frightened me when I saw in vivid detail what these brave women had to go through for the happiness of us all. And that it was all so intimately, thoroughly and dramatically recorded by documentarian Jeff Kaufman is a miracle about a miracle. A dream that I thought would never come true in my life-time, but the brilliant ” The State of Marriage” confirms and records that it IS so, and moves us all as it does. “I live in Times Square!” proclaims the giddy Gerwig, and the response is “Who lives in Times Square?” Well, full disclosure, I, for one, do. And the glorious Gerwig had me at “Hello.” The beauteous Heather Lind also scores as Gerwig’s rich arch-enemy who has stolen not only her ideas and her boyfriend, but also her cats! Mayhem ensues. Also, the much talked about, very original doc “The Wolfpack” was there at Provincetown, too, even though it is already out in general release. There’s a lot of Oscar talk about his incredible film, already seen on “60 Minutes”, “The Wolfpack” is so powerful and so positive about the good things film can bring even to the lives of the enclosed, some would say imprisoned Angulo brothers. Living in absolute squalor on the 14th floor of a high-rise in the worst housing projects in New York City, the six brothers escape into a world of film, a world we all know. Quentin Tarantino movies, “The Dark Knight” etc. Could “The Wolfpack” make it all the way to the Oscars in the Best Doc category? I think it’s pretty much known that this film has a happy ending and that first time filmmaker Crystal Moselle has had a kind of “Grey Gardens” story on her hands. So it’s all good. As were nearly all of the amazing docs and off-beat Indies at this year’s super-sharp Provincetown Film Festival. Sure it was raining. It was raining good films. Well, not only am I getting ready for a Very Important Reading of my new play “A Hyacinth Coat and a Chartreuse Hat” which occurs Monday night, this Monday June 1 at 7pm. 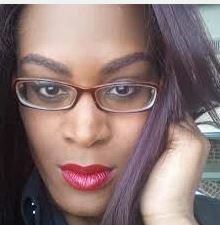 At the Actor’s Temple at 339 W.47th Street, New York, New York, I am also getting ready to go the the Provincetown Film Festival in June. And doing both these Big Things AT THE SAME TIME is no mean feat, I can tell you. But here’s a little taste of Provincetown from last year, a wild pedicab ride through P-town’s streets and wharves and seashore, by an enterprising young pedicab driver, Ryan Oberhelman, who was from Wyoming. This was his summer job! And what a way to spend your summer, eh?